By Kalpesh Desai, D.O., Jehan Barbat, M.D. A 34-year-old man presented with an incidental liver lesion. CT (A) showed an indeterminate hypodense lesion in the right hepatic lobe. 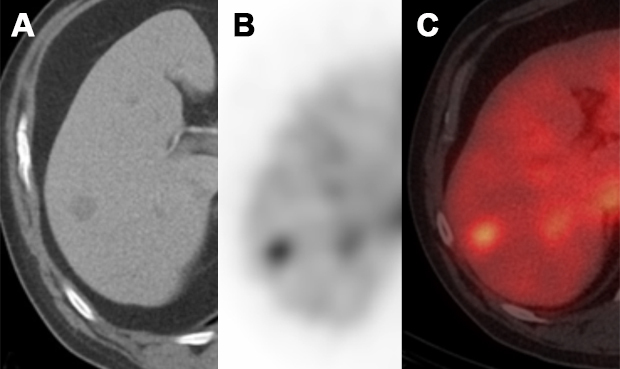 Subsequently, a Tc-99m red blood cell (RBC) SPECT/CT was performed (B and C) for further characterization. Focal radiotracer uptake localized to the lesion, which is most consistent with a liver hemangioma. A liver hemangioma is a benign hypervascular lesion frequently encountered incidentally. It is important to accurately characterize a lesion as a hemangioma, distinguishing it from other more aggressive lesions, including malignancy. The lesion size should be considered before performing this study. Only larger hemangiomas (> 3 cm) can be reliably evaluated by planar imaging. SPECT imaging is more useful with smaller lesions demonstrating a sensitivity of 91% in evaluating hemangiomas > 1.3 cm, but sensitivity decreases when lesions are subcentimeter.2 Hybrid SPECT/CT can improve reader confidence with precise anatomic localization. Ziessman HA, O’Malley JP, Thrall JH, et al. Hepatobiliary system. In: The Requisites: Nuclear Medicine, 4th ed. Philadelphia, PA: Saunders; 2014:156-163. Ziessman HA, Silverman PM, Patterson J, et al. Improved detection of small cavernous hemangiomas of the liver with high-resolution three-headed SPECT. J Nucl Med 1991;32:2086-2091. Desai K, Barbat J. JAOCR at the Viewbox: Liver Hemangioma. J Am Osteopath Coll Radiol. 2018;7(1):33. Kalpesh Desai, D.O., Jehan Barbat, M.D. Dr. Desai and Dr. Barbat work with the Department of Radiology, Garden City Hospital, Garden City, MI.